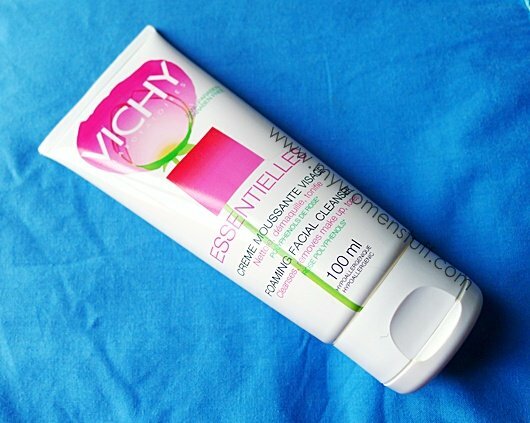 So when my daytime facial cleanser ran out (yes I do run out of products 😛 ) I went a-hunting for a new inexpensive facial cleanser and found one – the Vichy Essentielles Foaming Facial Cleanser! I used to hear rumblings of dissent every time I mentioned Vichy products because there would always be someone saying it was rather pricey for a pharmacy brand. Vichy seems to be paying attention, because the Essentialles range is very affordably priced for the brand. I’ve liked a few of the Vichy cleansers I’ve tried (Purete Thermal Foaming Cleansing Water, Normaderm Cleansing Purifying Gel, Normaderm Anti-Imperfection Deep Cleansing Foaming Cream cleanser <- Yes I realise I’m behind on reviews 😛 ) so trying a new inexpensive cleanser from the range was a bit of a no-brainer. The Vichy Essentielles skincare line is a basic skincare line that is very affordably priced and targeted at the younger set, as an introduction to the brand. 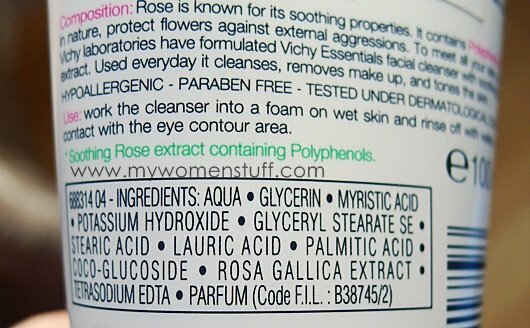 I personally don’t quite like the packaging, preferring the regular clinical look of the Vichy packaging but the pink blotches are supposed to represent rose petals from which rose polyphenols are extracted, which soothe, hydrate and reveal radiance form part of the ingredients. Ingredients aside, this is a straightforward foaming cleanser. Dollop on palm, lather up into a foam and wash your face. Tada! Done. Nothing complex about it. This foaming cleanser really takes its name at face value (pun intended!) A tiny dollop foams up into lovely thick lather that feels really nice on the skin. Unlike many other foaming cleansers, I do not find this one drying. My skin feels comfortable after washing, and there is no tight feeling. I can’t tell if it soothes my skin or reveals radiance. For me its just a straight forward face cleanser and that’s that! Oh and here’s the ingredient list for those who are interested. These are no parabens in here. It comes in a 100ml tube and I think this is going to last me a long while! The Vichy Essentielles Foaming Cleanser retails at RM25/100ml and is for all skin types. Available at most leading pharmacies nationwide. NEXT POST: All Aboard the Anna Sui Flight of Fancy! Yeah! I got it just 2 weeks ago from their “exchange old cleanser for new one” program. I agree that it’s a straightforward cleanser that does its job well. Yeah don’t fancy the packaging too. ah, I haven’t tried the cleanser (have too many to go through as it is!) but I really like the moisturizers. Like the cleanser, they are straight up moisturizers that get the job done. Lotion’s light enough for under makeup, cream is rich enough for night. Awesome line! I didn’t try the moisturizers! LOL… May get round to them or if not someone will 😉 But since it worked for you and considering you have sensitive skin, it sounds like a pretty decent line for the price point! Well its a cleanser that is supposed to clean off oils, so no. But I’ll definitely give this a go…soon.